The best tutorial for how to make a shirt with a Cricut! Everything you need to know from how to design, to cut Cricut iron on vinyl, to ironing it onto a t-shirt! Hey guys, I’ve got a super fun DIY for you today. You can make any shirt you’ve wanted or dreamed up! I’m Anna, and I’m happy to be here today to share my Cricut expertise. I typically blog at Practical and Pretty. If you’re like me, you have a lot of inside jokes with family or friends and love custom shirts. I have spent SO much money on custom shirts online. Since I’ve gotten a Cricut, each new t-shirt costs me the price of a plain t-shirt! I’m telling you, this is life changing. 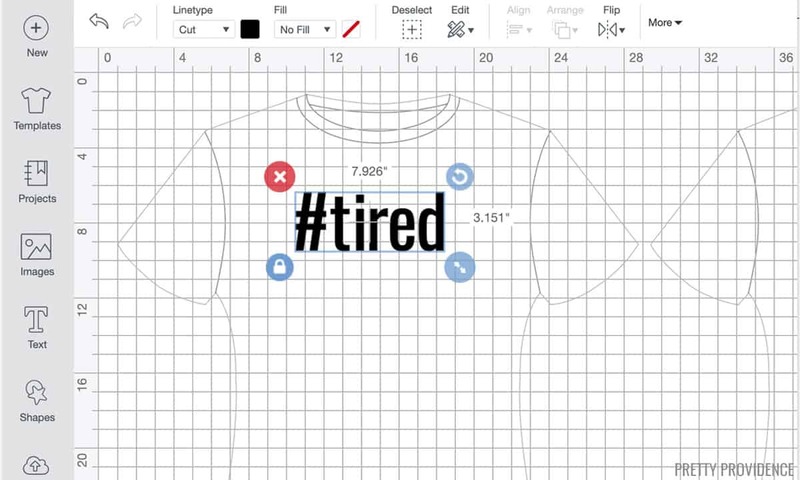 Making a t-shirt requires two important steps. First, you have to decide what you want it to say! I suggest sticking with one color on your first try. Sayings, phrases or words are perfect for this. Second, you need to pick out what shirt you’d like the saying on. I made this ‘fries before guys’ shirt for my beautiful sister. She ran to Target and found a soft flowy shirt she loved. Make sure the shirt is ok to be ironed, because you will be using an iron on it! This shirt I picked was mostly Rayon. I’m not sure I’d suggest this material, especially on your first shirt. It was stretchy to the point that removing the sticky part from the iron on vinyl was challenging. BUT, it will still work if you’re up for the challenge. 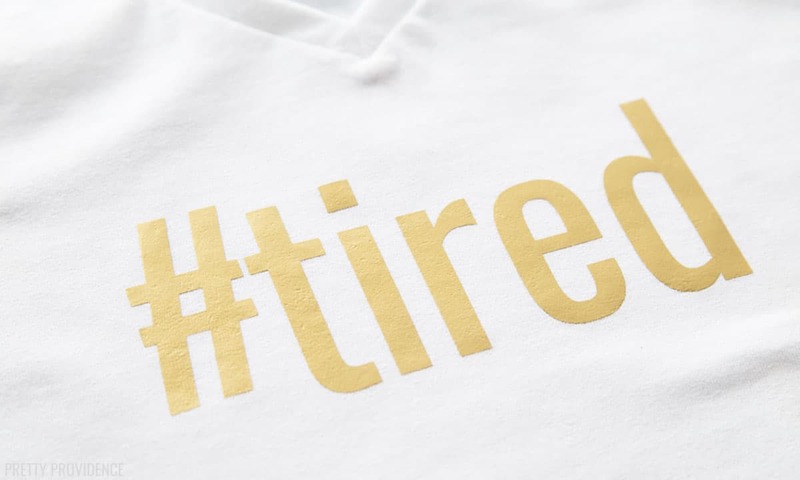 The best t-shirt material for iron-on vinyl is cotton. I’m going to walk you through how to make a shirt step by step here. If you’re more of a visual learner, watch the video first! I’ve also attached screen shots for you so you can see exactly what each step looks like. You’ll start with your image. 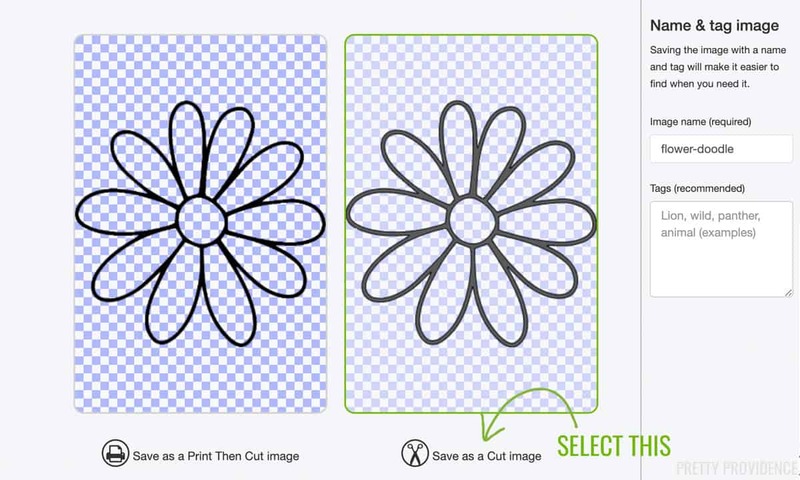 You can create an image in Cricut Design Space, or upload an existing image from your computer. I wanted to upload an image so you could see how to do that. Open Cricut Design Space! Choose your canvas by clicking ‘Canvas’ on the left. This is a baseball tee type shirt so I selected that. 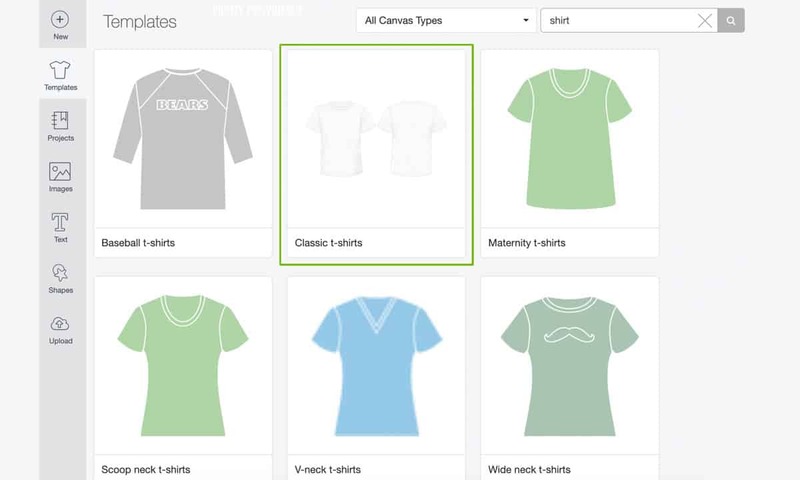 Make sure to set the size of shirt under ‘Canvas’ on the right. 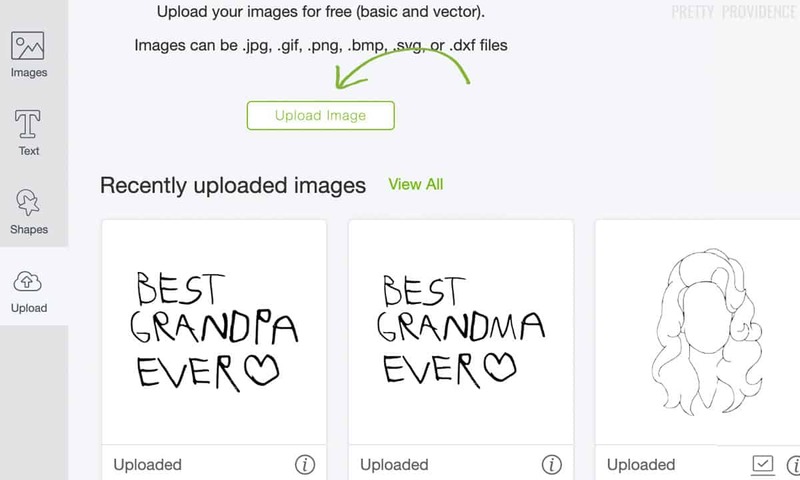 Click ‘Upload an image’ on the left. 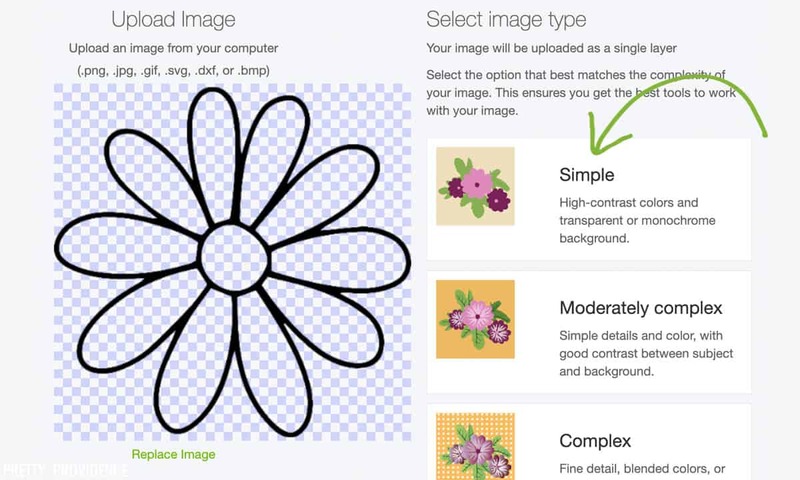 Select your image by browsing your files and select what type of image it is. For this project, and most projects with iron on, you’ll select ‘Simple Cut’. Now you click the whitespace that you’d like cut out. Remember to get the insides of each letter. This is really fun for me for some reason. It takes me back to my Microsoft Paint days when I used to use the Bucket tool. Remember that? Put this image on your canvas and size it to your liking. 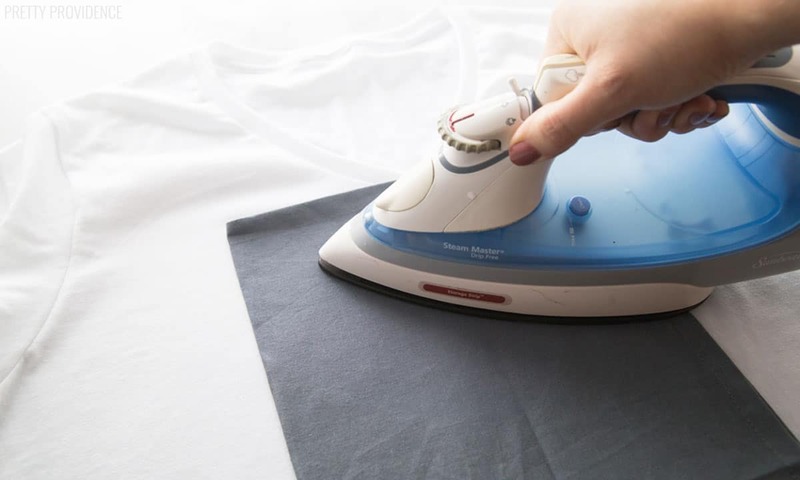 Place iron on vinyl shiny side down on your mat and turn the dial to Iron-on, or select Iron-on from the materials drop-down menu. Ok, here’s another important and easy-to-miss step. Click ‘Mirror image for Iron-On’ before hitting ‘Go’! After the cut is done, remove the excess vinyl around the edges. Use your weeding tool to take out the little pieces in the letters. Now you get to iron it on! 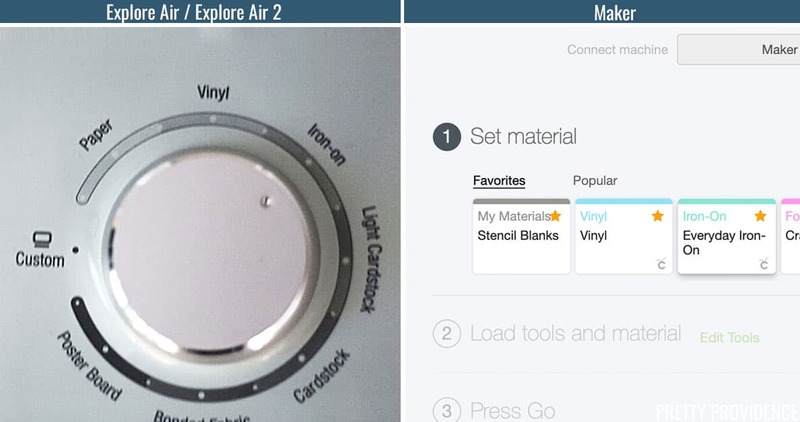 Set your iron to ‘Cotton’ or the hottest setting it will go to. Make sure there is no steam. Start by getting the material warm. Put the iron on the shirt for about 15 seconds. Place your iron-on vinyl where you’d like it. Put a press cloth, or plain cotton cloth, on top of the plastic. This is important so you don’t melt the plastic onto your shirt. Put the iron on top of the press cloth for about 30 seconds. Flip your shirt over, and do the same thing on the opposite side of the shirt. Now you will pull off the sticky part and separate it from the vinyl. Do this while it’s hot! It will be a lot easier. If a piece isn’t coming off, place the iron directly on the part you are trying to pull up and it should pull off. The plastic should be removed from the vinyl now! Put the press cloth back on and do another run with the iron so you know it’s on there really well. You’re done! It seems like a lot of steps, but I promise making a shirt is so simple! I have already made so many custom t-shirts (almost 20!!) and I’ve had my Cricut for about a month. I hope you’ll share your fun t-shirt creation too! Check out our new font reference post: Cricut Fonts – Everything You Need to Know. 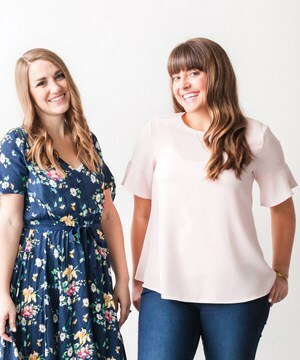 In it we share our FAVORITE Cricut fonts and answer tons of FAQ. Hi, thanks for the tutorial, it’s great! I have a random editing question. Using design space, I’m trying to get rid of an odd shape before I print and cannot for the life of me figure it out. I cannot slice because it’s all 1 shape (a trex silhouette, and I’m trying to get rid of the shadow between his feet). Any suggestions? Whyyyyy is there no simple erase wand? I just figured out how to erase a part of something the other day! I’m not sure if it will work perfectly for you for the shadow, but you can try! 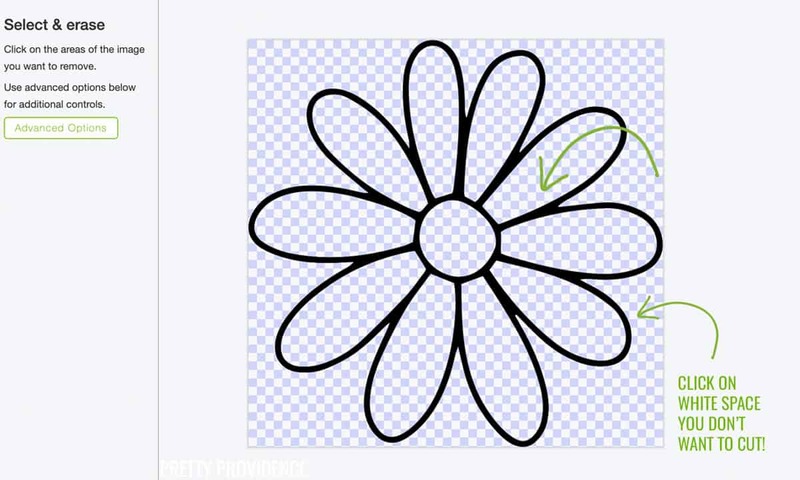 What I did is I put another shape over the part of the image I wanted to remove, and then I highlighted both images and sliced. It worked! I was able to just slice out that one part of the image and delete the extra shape too. Hi! Would a Cricut Expression 2 work very good for making tshirts and coffee mugs? I’m not sure, we’ve never used one before. Sorry I can’t be more help! I have the regular Cricut air (not air 2) can I make these shirts with my reg air??? Yes, the Cricut Explore Air cuts iron-on very well! I am looking for a machine to do the t-shirts, and coffee mugs as well as sports drink bottles. What all do I need? Hey Jamie! If that’s all you are interested in doing, you could do it with a Cricut Explore, Cricut Explore Air 2 or Cricut Maker. With each upgrade of machine, there are more possibilities. Then, you will need mats, some weeding tools and then of course the iron-on and vinyl material. It’s so fun and so worth the investment if you love making things like that! 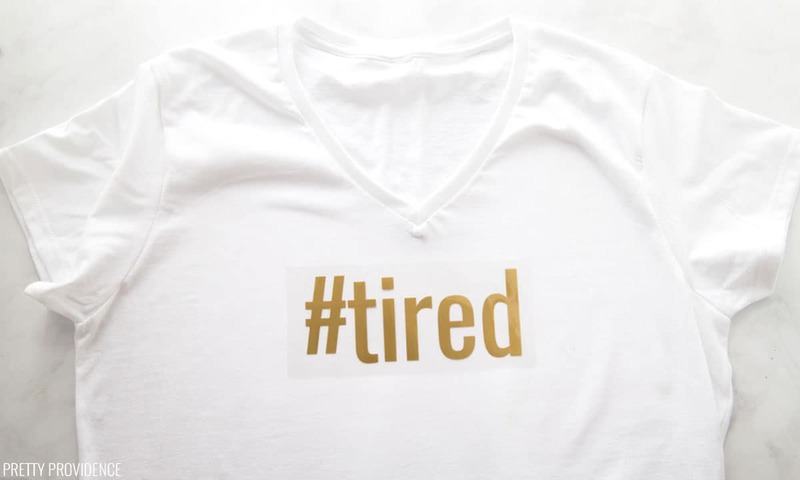 What is the best type of cricut to buy for shirts anand things like that? Any of the Cricut machines will be able to make shirts! In my opinion though if I was going to spend the money to buy a machine today I would buy the maker since it is already a big investment, I would want my machine to do as much as possible if that makes sense! In design space you would attach your letters and or words so they stay in place and then you can merge your designs on transfer tape, yes! Cricut makes it so easy. Hi. 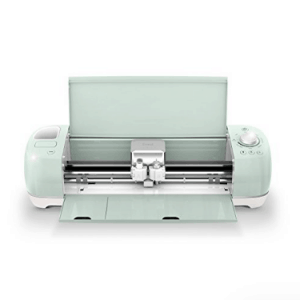 I have just purchased the Cricut Explore Air 2. I am wondering what is photoshop that you are talking about? Also I have the Crucut Design space, but when I type in my text, the larger I make it, I am not able to see it all in the text box. Do you know how I fix this? GIMP is comparable to photoshop. I use both for my digital art. GIMP is perfect for people that can’t afford photoshop. So true! Good suggestion, I used to use GIMP all the time! Hey Alana! 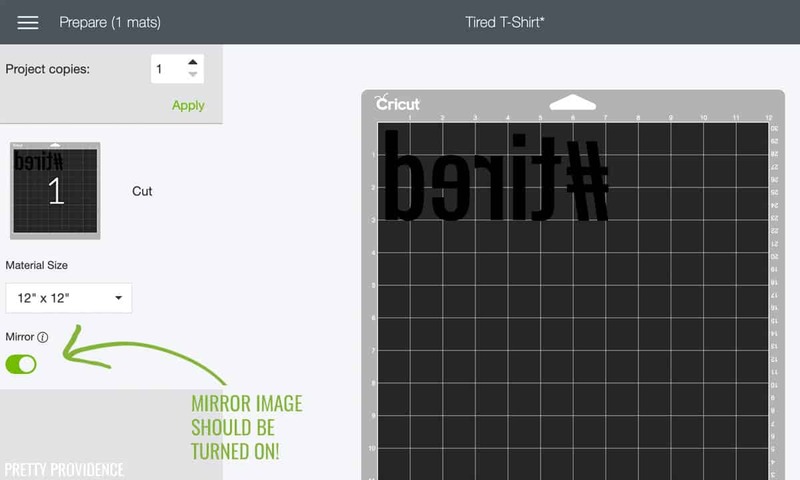 Yes, you can totally do this with the Cricut Maker – that’s what we use now. The only difference in the process is that instead of using a dial on the machine to choose your material, that option will come up in Design Space for you to choose Iron-On before cutting. Hello. I have a explore one can I make t shirts with that? Should you wash the shirt prior to applying the vinyl? It is recommended to wash the shirt first, but I’ve done it without washing them first and it’s still stayed on really well! Can we make cricuit expression? How long does the lettering last? If you follow all the directions exactly your t shirt will probably wear out before the lettering! I’ve never had the lettering come off first! Thanks for sharing this great tutorial! I use Photoshop ALL the time but have not been able to transfer my designs to my Cricut Explore Air. Can you please tell me how to do this as I have spent HOURS looking on the internet for tutorials or help with this to NO avail! 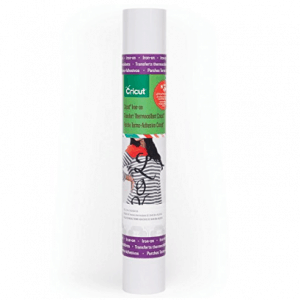 This is a good read to know how to make a custom shirt cricut. Thank you for sharing! Yay! Oh I am so so glad you love it! Thank you! I have cricut explore air .. where would i fine my image from .. i want to yry and print on vinyl and make a t-shirt.. this would be my fIrst try.. In Cricut Design Space there are tons of images you can use! Try playing around with that and take advantage of the video tutorials found on cricut website. 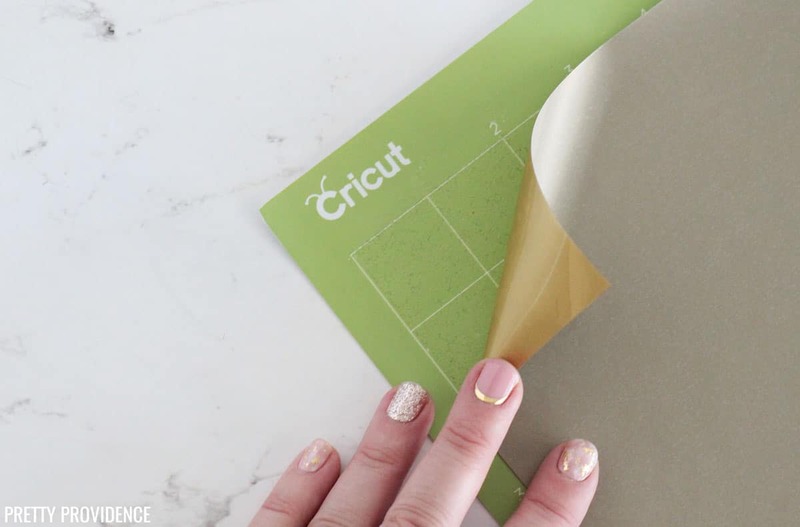 What cricut did you purchase? Does it come with the black mat? Hey Nicole! The machine used here is a Cricut Explore Air 2. They can be purchased alone or with a bundle that includes some mats and tools. In Cricut Design Space the canvas shows up black while you are preparing to cut. The standard grip mat, used to cut iron-on and vinyl and things like that, is green! I don’t think you are able to upload your own designs with the expression 2 – and I know that machine cuts vinyl but I’m not sure about Iron-On! I’m sorry! I wish I could be more help. My first machine was a Cricut Explore and you can do all of this with one of those for sure. Did everything you need come in the Box with your machine? Or what additional items would need purchased to make shirts? How much roughly does it cost to make 1 tee-shirt on your own cricut machine? Well if you have the t shirt and the vinyl then it is free! Vinyl costs about $10 a roll, but you can make a lot more than one t-shirt with it. I can usually find cute plain t shirts on sale at Target/Walmart/Old Navy or Amazon for around $5, so it is definitely pretty cost effective and gets you exactly what you want! So I just received the Cricut Maker for Christmas. I am a beginner being that this is my first experience with a Cricut ever. I’m slowly acquiring all of the tools that I need and even some that at the moment I don’t need. My question is about iron on vinyl. I want to make custom shirts with my two dogs on them. Is there any printable iron on vinyl that you’d recommend? Does it even exist? Any tips/tricks would be greatly appreciated! In your opinion, is a heat press necessary for making t-shirts? I have been wanting to make a t-shirt but am afraid of making one and the vinyl coming off because I didn’t use a heat press..
Definitely not! I always just use an iron. You just want to make sure you iron really well.. I press my iron down in a circlular motion for a few minutes and it works great. Can this machine be used for making several shirts of the same kind? Yes! It’s easy to cut the same design multiple times. The vinyl doesn’t come off when washed? Nope!! I’ve washed mine dozens of times! Crazy huh?! 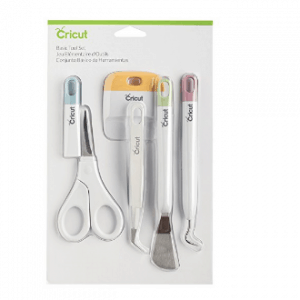 Which Cricut do you have? I love this idea and I’m looking into purchasing one! I have the Cricut explore air! but they just came out with a new machine that is AMAZING too! I want to maybe start a little t-shirt business, you recommend this item? Does the transfer show outline edges ? Hey Natalia! Nope, the transfer does not show any outline edges. It’s really clean! I have never done more than just making shirts here and there when I have the itch so I’m not sure! I do have a friend who has a vinyl business and uses this machine for that. I think it’s probably great for it!? Best of luck!! !